Welcome to the season opener for the Oklahoma City Thunder. Hold on, what? It’s not the season opener? It’s the 46th game of the season? Wow! With the amount of time we’ve been off (4 whole days) and the amount of time since the last home game (over two weeks), you can see how it feels like an entire off-season since we’ve last seen the team live. Also, this is the longest we’ve had to marinate after a loss since Game 5 of last season’s Finals. Needless to say, Oklahoma City is chomping at the bit to play a game at home. Their opponent for their return back home is the new look Memphis Grizzlies, although Memphis may be a bit short handed tonight. Yesterday, the Grizzlies traded Rudy Gay and Hamed Haddadi to the Toronto Raptors for Ed Davis and Jose Calderon. The Grizzlies then turned around and traded Calderon to the Detroit Pistons for Tayshaun Prince and Austin Daye. Unfortunately (or luckily for the Thunder), those players will not be available for the Grizzlies tonight. But it’s not like this will be an easy game. This is basically the same team that took the Thunder to 7 games two postseasons ago in the Western Conference Semis. That team was also without Rudy Gay, who was out following in-season shoulder surgery. 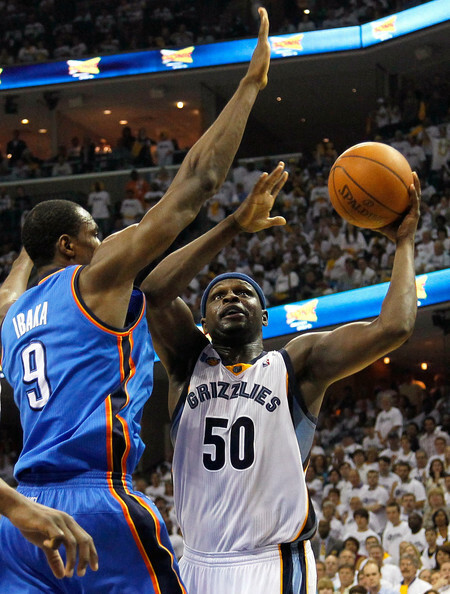 The Grizzlies defeated the Thunder in their first meeting this season, 107-97, in Oklahoma City. In that game, Rudy Gay hit every big shot in the 2nd half to keep the Thunder at bay. Much like what the Thunder were facing in their 3rd game of the season, the Grizzlies will be getting acclimated to life without a key component of their team. 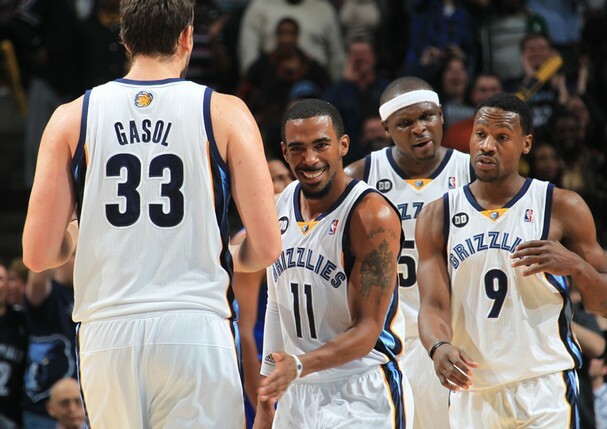 The Grizzlies come into the game with a 29-15 record, good for 4th in the Western Conference. Though they struggle to score points (93.4, 27th in the league), they more than make up for it with the best defense in the league, in terms of opponents’ ppg (89.5, 1st in the league). Offensively, they are highly dependent on post play and taking care of the ball. On defense, they use their physicality and brute strength to gobble up boards and get opponents out of position on offense. The offense is led by the big boys inside, Marc Gasol and Zach Randolph. Though not a very athletic duo, their high basketball IQ more than makes up for their athletic shortcomings. Randolph, who was selected as a reserve to the All-Star game, averages 15.8 points and 11.6 rebounds per game. Gasol, who has been struggling a bit this season, averages 13.7 points and 7.5 rebounds per game. 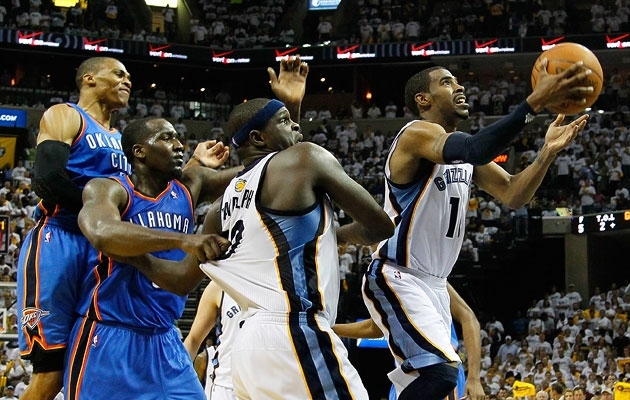 The offense is directed by Mike Conley, who is one of the better floor generals in the league. SG Tony Allen is one of the best defensive wings in the league. The bench is one of the more consistent ones in the league, with 6 players each averaging more than 14.5 minutes and scoring more than 5.5 ppg. Don’t give this team a chance – Yes, they just lost their best scorer. Yes, they will be shorthanded. But, don’t give this team a chance or they will steal this game. Memphis is a veteran bunch that has won without Rudy Gay before. Take advantage of their lack of depth and play transition basketball and try to draw fouls. Control the boards – While Memphis may not score much, their bigs do get a lot of rebounds. This leads to extra opportunities offensively, which is big for a team that is short handed. If necessary, Kevin Durant may need to hedge over to the post to help out on the boards. Play Randolph smartly – Serge Ibaka always seems to have trouble against crafty, non-athletic PFs (Randolph, Nowitzki, etc.). Don’t bite on the pump fakes and keep your hands straight up in the air. It seems like when the Thunder play the Grizzlies, Collison always ends up in the game for an extended period of time due to Ibaka’s foul trouble.